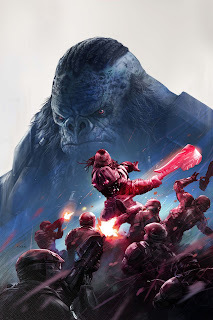 Faraway Press: The Online Home of John Jackson Miller: My next Halo work appears in HALO: RISE OF ATRIOX! My next Halo work appears in HALO: RISE OF ATRIOX! ...and then another at the Portage County Public Library in downtown Stevens Point, Wis., on the 13th. But there's always time for an announcement — and this one's just been made by the Halo Waypoint blog. Following my first Halo comics story in Halo: Tales from Slipspace, I'm joining the writers on the Halo: Rise of Atriox series, which debuts in August and chronicles the career of the warlord from Halo Wars 2. There'll be more details about my specific material in the series later, but the first issue can already be preordered at your local shop and here. The series launches on August 2.